Many Exchange administrators are familiar with the Get-ADPermission cmdlet. In the contrary to the Get-MailboxPermission cmdlet, the Get-ADPermission cmdlet retrieves Active Directory permissions for an object, instead of permission in Exchange itself. For instance, the Get-ADPermission cmdlet will reveal e.g. Send-As permissions whereas the Get-MailboxPermission cmdlet will tell you e.g. who has Full Access permissions on the mailbox. If you are dealing with a large number of mailboxes (e.g. several thousands of mailboxes), using the Get-ADPermission cmdlet can be quite limiting. During recent testing, I noticed the command took anywere from 2-8 seconds per mailbox to complete. In this particular scenario, I was helping a customer to move user accounts from their (old) account forest into the new resource forest. As part of the process, we would enumerate all mailbox permissions (including Send-As), and check if any of them were assigned to a user account in the account forest. However, because the source environment has tens of thousands mailboxes, the Get-ADPermission approach was not feasible. Normally, querying AD is not a problem. If you’ve ever written an LDAP query, you probably noticed that most of them complete within several seconds –depending on the result set size, of course. But either way, talking directly to AD should be a lot faster. As such, and given that Send-As permission are assigned to the user account in AD, I figured that using the Get-ACL cmdlet would be best suited. The result of the cmdlet will look similar to what you see above. For brevity purposes, I’ve omitted some of the results. Nonethelss, it should give you a good picture of what to expect. So far, so good. However, none of the entries mentioned “Send-As” anywhere. As it turns out, the objectType attribute contains a GUID which refers to the actual permission. AD stores information about Extended Rights in the configuration partition, in a container unsurprisingly called “Extended-Rights”. Using ADSIEdit, you can navigate to the Send-As Extended Right, and look for the rightsGuid attribute. I’ve checked in various labs and environments, and the Guid always turns out to be ab721a54-1e2f-11d0-9819-00aa0040529b. While benchmarking this approach, we were able to return results for approximately 1-5 mailboxes per second. Quite an improvement over before! The one caveat is that Get-ACL does not return the same result set (in terms of what attributes are shown) as the Get-ADPermission cmdlet. If all you care about it the permission itself, or if you already have all the other information for the mailbox (e.g. because you previously ran Get-Mailbox), than the speedy approach using Get-ACL might just offer all you need. Earlier this month, I wrote an article on how you could use a KEMP LoadMaster to publish multiple workloads onto the internet using only a single IP address using a feature called content-switching. Based on the principle of content switching, KEMP LoadMasters also allow you to modify traffic while it’s flowing through the device. More specifically, this article will show you how you can rewrite URLs using a Load Master. The rewriting of URLs is quite common. The goal is to ‘send’ people to another destination than the one they are trying to reach. This could be the case when you are changing your domain name or maybe even as part of a merger and you want the other company’s traffic to automatically be redirected to your website. Let’s start with a simple example we are all familiar with: you want to redirect traffic from the root of your domain to /owa. The goal is that when someone enters e.g. webmail.domain.com, that person is automatically redirected to webmail.domain.com/owa. 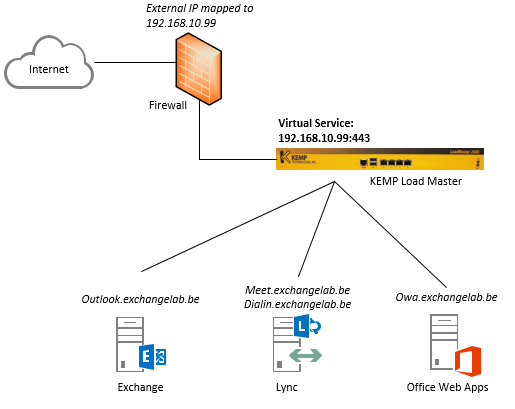 Although Exchange 2013 already redirects traffic from the root to the /owa virtual directory out-of-the-box, the idea here is to illustrate how you can do it with KEMP instead of IIS. As a result you could just as easily send someone from one virtual directory (e.g. /test) to another (e.g. /owa). By default, it suffices to create such a header modification rule and assign it to a virtual service. By doing so, you will rewrite traffic traffic to the root (or the /test virtual directory) and people will end up at the /owa virtual directory. 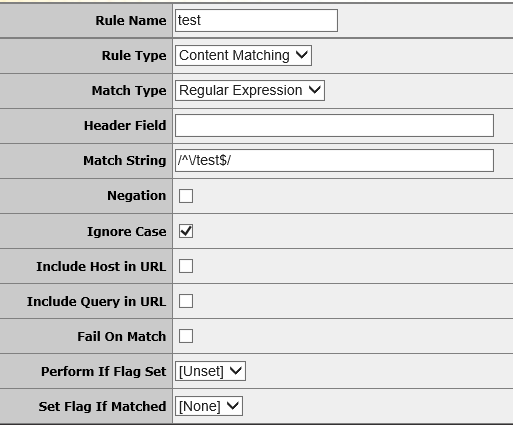 In the virtual service, go to HTTP Header Modifications and click Show Header Rules. If you don’t see this option, make sure that you have Layer 7 enabled and that you are decrypting SSL traffic. This is a requirement for the LoadMaster to be able to ‘read’ (and thus modify) the traffic. That’s it. All traffic that hits the LoadMaster on the root will now automatically be rewritten to /owa. When you are already using content rules to ‘capture’ traffic and send it to a different virtual directory (as described in my previous article), the above approach won’t work – at least not entirely. While the creating of the header modification rule and the addition of that rule to the virtual service remain entirely the same, there is an additional task you have to perform. First, let me explain why. When you are already using Content Rules the LoadMaster will use these rules to evaluate traffic in order to make the appropriate routing decision. 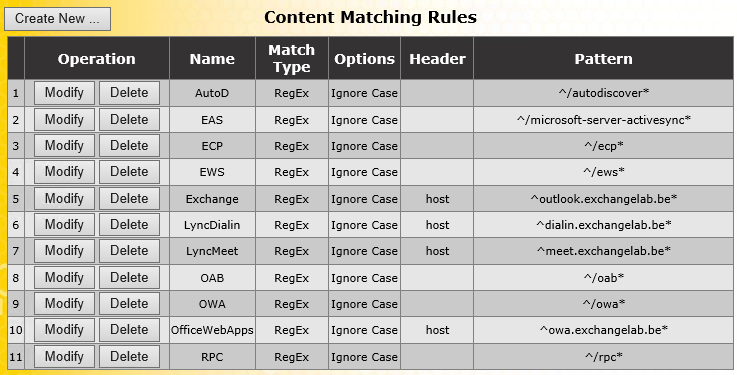 As a result, these content rules are processed before the header modification rules. However, when the LoadMaster doesn’t find a match in one of its content matching rules, it will not process the header modification rule – at least not when you are trying to modify a virtual directory. As I will describe later in this article, it will still process host-header modifications though. So, in order for the LoadMaster to perform the rewrite, the initial destination has to be defined on the virtual directory where you want to redirect traffic to. Let’s take the following example: you are using content rules to direct traffic from a single IP address to different virtual directories. At the same time, you want traffic from an non-existing virtual directory (e.g. /test) to be redirected to /owa. That’s it. If you now navigate to the /test virtual directory, the traffic will automatically be rewritten to /owa. How about if I want to redirect more than a single virtual directory to /owa? What about rewriting host names? Once you have created the rule, add it the the HTTP Header Modification rules on the virtual services and your done. Traffic that hits test.domain.com will now automatically be rewritten to webmail.domain.com. It’s as easy as that. Rewriting URLs with KEMP’s LoadMaster is relatively easy. You only have to watch out when you are already using content switching rules as I described earlier. Finally! First Exchange 2013 Sizing Information released. Yesterday, Microsoft’s CXP team (Customer Experience Team) released a lengthy blog post containing practical information towards sizing of Exchange 2013. A moment we all have been waiting for since the product was released in October of last year. With this new information, it will finally become possible to create a decenter design and migration approach. 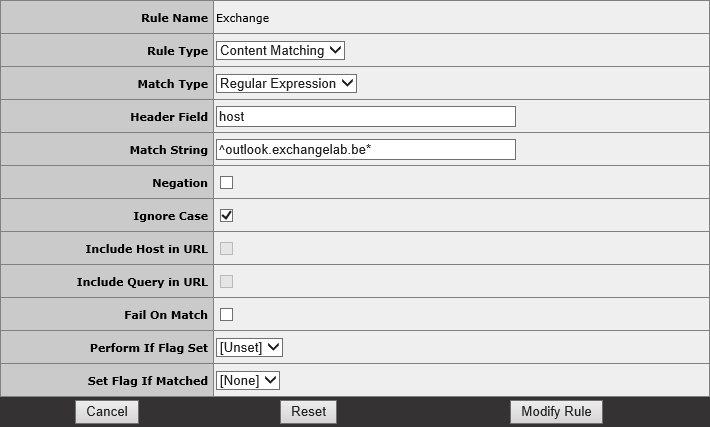 Unfortunately, there’s still no trace of the Mailbox Server Role Requirements Calculator which is – let’s face it – the reference tool when properly sizing an Exchange Server environment. The only mention in the article states that it’s coming somewhere later this quarter. Looks like we’re going to have to be a little more patient, don’t we? Nonetheless, with the information from the article, you should be set on your way as it contains all the information you need to properly size a new Exchange 2013 Server environment. Please do keep in mind that this is Microsoft’s first guidance on this topic and is likely to change over time as customers and also Microsoft gain more experience with the product in more real-life deployments. Over the course of the next weeks, I hope to provide you with some comparative figures between Exchange 2010 and Exchange 2013, but for now it looks like Exchange 2013 is quite hungry on Memory and CPU. However, from an architecture point-of-view, it’s not all that surprising. After all, memory and CPU are relatively cheap these days.